Suspended lamp for diffused, upward and downward lighting. Chrome or brushed nickel-plated metal structure. 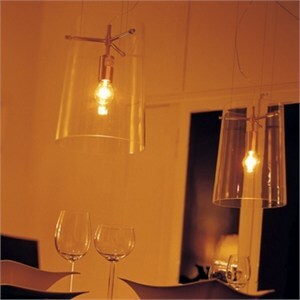 Transparent crystal blown glass diffuser. Swag mount with triple cable support for diffuser. Uses 1 X 150W max medium base incandescent bulb (not included). Design: Mengotti/Prandina. Italy.